FILE - A smartphone user displays a Facebook news feed in a May 2, 2013, photo illustration. Facebook revealed Wednesday it found hundreds of accounts traced to a St. Petersburg-based organization that bought about 3,000 ads for $100,000 from June 2015 to May 2017. Revelations that Russian-linked accounts paid for thousands of political ads to appear on Facebook during last year’s presidential election may be just “the tip of the iceberg,” according to a top U.S. lawmaker. 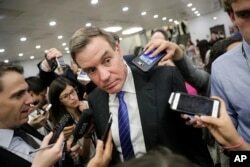 Russia also likely manipulated other social media platforms, such as Twitter and Google, Democrat Mark Warner, vice chair of the Senate Intelligence Committee, told a security conference Thursday in Washington. He said he would like to see other social media companies, including Twitter, conduct similar investigations and share the results. 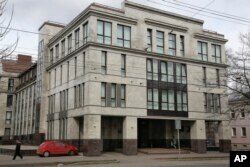 An internal investigation Facebook released Wednesday found 470 accounts traced to a St. Petersburg-based organization bought about 3,000 ads for $100,000 from June 2015 to May 2017. FILE - Senate Intelligence Committee Vice Chairman Sen. Mark Warner, D-Virginia, whose panel is investigating Russian interference in the 2016 U.S. election, speaks with reporters at the Capitol in Washington, June 22, 2017. Warner says he would like to see social media companies conduct investigations into how Russia might have used their platforms to meddle in the U.S. election. The social networking giant said that while the ads did not directly mention the election or either candidate, they largely promoted divisive social issues, like immigration, race relations and gun control. All the accounts in question have been suspended. Facebook’s chief security officer, Alex Stamos, said the company is cooperating with a federal investigation into the matter. Special counsel Robert Mueller is overseeing a probe into Russian meddling in the U.S. election and any potential coordination with associates of President Donald Trump. Warner said lawmakers could potentially pursue reforms requiring ads on social media to tell users who is behind the content, similar to existing laws governing other political advertisements. U.S. intelligence officials have voiced repeated concerns that Russia will try to use similar influence campaigns in upcoming elections. And some lawmakers fear the problem is only going to get worse. FILE - A women enters a four-story building known as the "troll factory" in St. Petersburg, Russia, April 19, 2015. Facebook says some of the ads in question were purchased by accounts with IP addresses in the United States but set to Russian in the language settings. “What has been unleashed is not going to be put back in the bottle,” warned Adam Schiff, the ranking Democrat on the House Permanent Select Committee on Intelligence. “If the Russians want to get into the DNC in 2020, they will get in. If they want to get into the RNC, they will get in,” he said. Facebook and other social media companies have come under intense pressure since the election to curb the flow of false information. Facebook has conceded its network was exploited by governments and other interests intent on manipulating public opinion, including during the presidential elections in the United States and France.